Are you sure it's a skink? No, that's not a silly question. Not many people have ever seen a skink in the wild, and those that do often only get a fleeting glance. 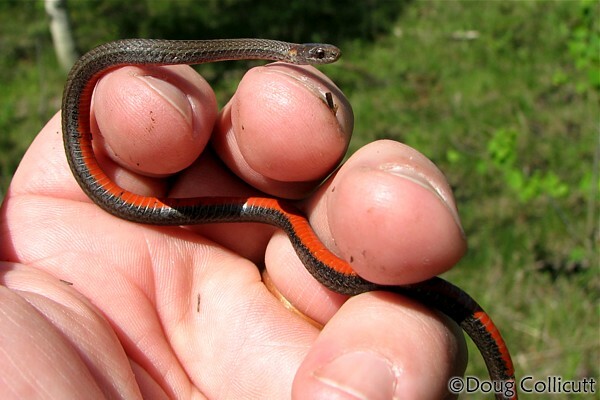 And there are some other critters out there that could be mistaken for a skink, especially if they're moving fast. Here's a guide to some of the likely candidates. 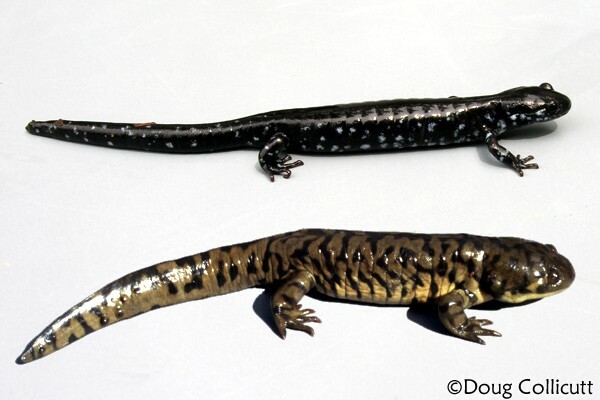 In Manitoba there are two species of terrestrial (land) salamanders, the tiger salamander (Ambystoma tigrinum) and the blue-spotted salamander (Ambystoma laterale), that share the same body shape and are roughly the same size as a skink. Salamanders have smooth, moist skin and they do not have scales or claws. 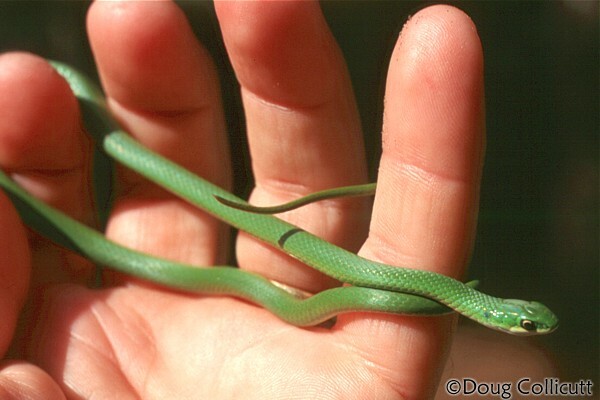 They also do not have the ear-hole that is visible on a skink. 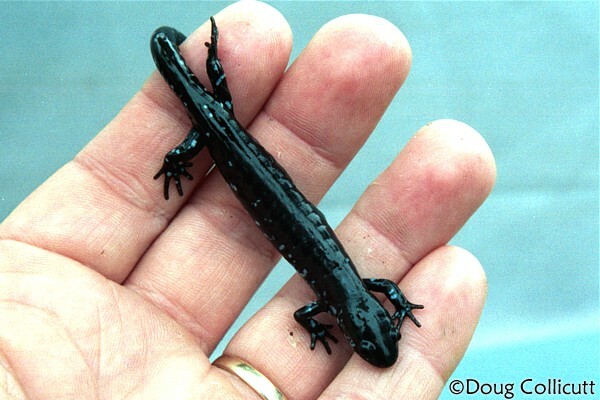 The blue-spotted salamander is shiny black in colour with small bluish white spots. It's found in southeastern Manitoba in regions of boreal or mixed forest. The tiger salamander is highly variable in colour, from light greenish brown to dark grey, and has darker bands or stripes, and sometimes spots. 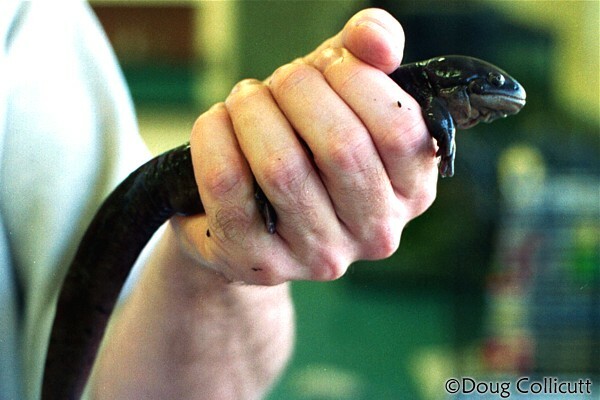 Adult tiger salamanders are much larger than a skink, but young ones can be close to a skink in size. Both these salamanders like to hide under rocks, logs or debris, just like skinks, but salamanders are only found in spots that are quite moist. Only the tiger salamander is known to occur around the area where skinks have been reported in southwestern Manitoba. For more information on Manitoba's salamanders visit The Blue-spotted Salamander or the Amphibians of Manitoba in NatureNorth. Skinks have quite a serpentine movement when they are scooting through the grass, so mistaking a skink for a snake or vice versa is easy to do. 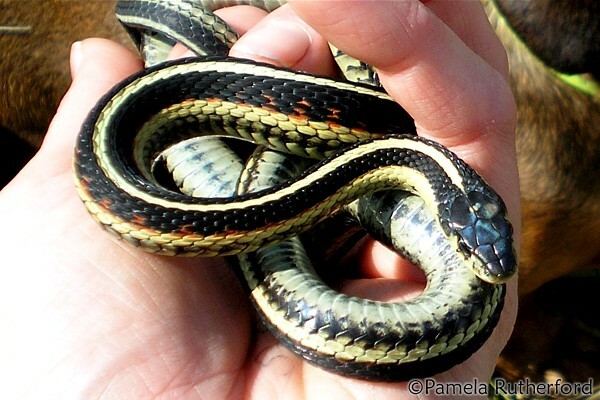 There are 5 species of snakes found in Manitoba: the red-sided garter snake (Thamnophis sirtalis), western plains garter snake (Thamnophis radix), western hognose snake (Heterdon nasicus), smooth green snake (Opheodrys vernalis) and northern redbelly snake (Storeria occipitomaculata). 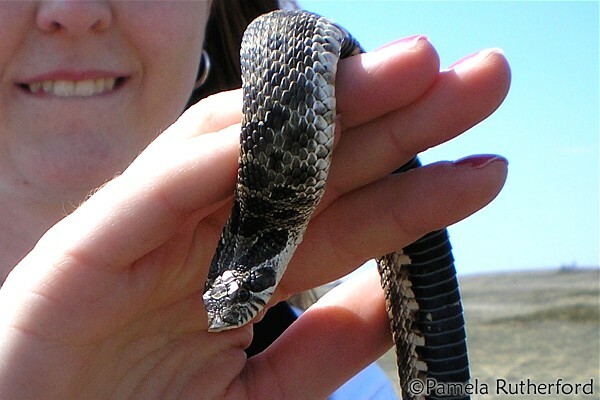 Because of its colouration, the hognose snake is the most likely of our snakes to be mistaken for a skink, and then only if it was a young and small individual. 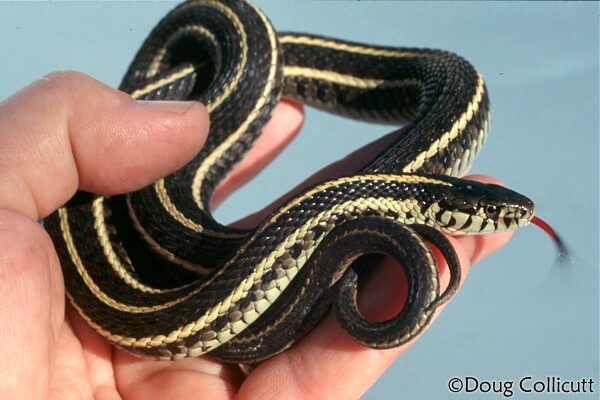 Click the thumbnail image for a slide show of Manitoba's snakes with some pertinent information given about each.